Everyone’s favorite picture-laden news reader app, Pulse, updated to version 2.0 today and now allows you to add up to 60 of your favorite feeds in that beautiful column format. They’ve also enhanced the performance by improving swiping smoothness and made sharing with your favorite social outlets easier. 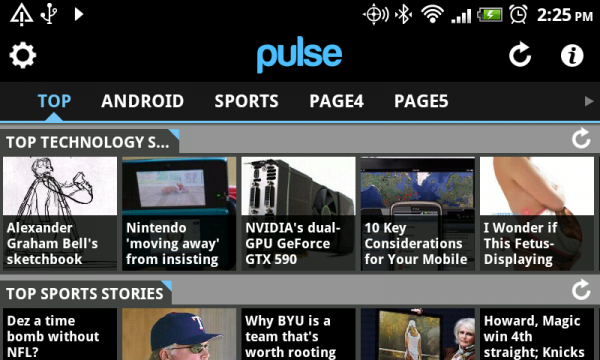 Is anyone using anything besides Pulse or Google Reader these days? Top two in my opinion. Three Times More Sources: Personalize your mobile news reading experience by selecting up to 60 news sources (compared to the previous 25) across five customizable pages. Improved Google Reader: We now save stories read offline on Pulse and sync them to Google Reader when the app is online later. Smooth Swiping: We have improved swiping between stories in text and web view to be smoother than ever.